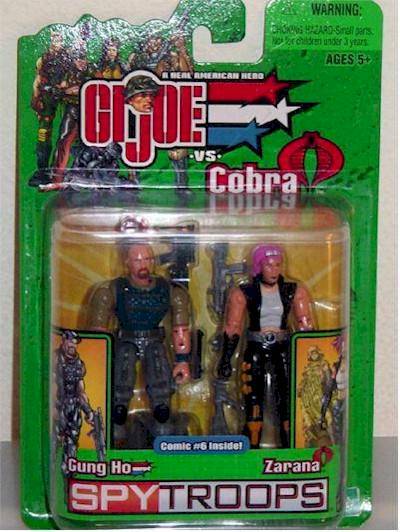 Coheteboy is hitting us up with some more Spytroops reviews - tonight it's Gung Ho and Zarana. Take it away! More and more Spytroops toys have been arriving, and today we will take a look at updated versions of a Marine and a Dreadnok. This is the second (or third depending on how you look at it) sculpt of GUNG HO in the new line and ZARANA'S first. For those who are completely new to the concept of SPYTROOPS, there's not much to it really. 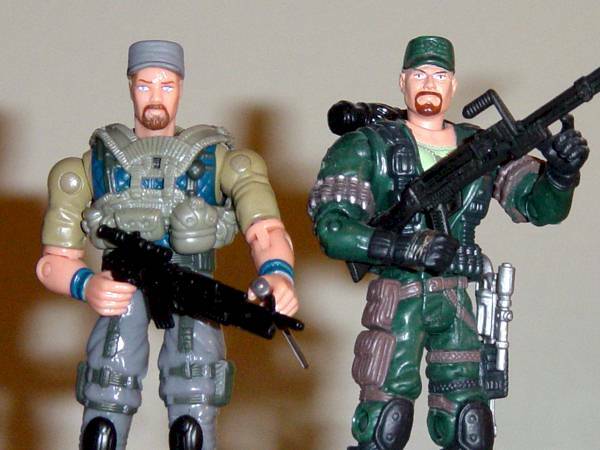 It's just a gimmick that allows one of the Joes or Cobras to play "dress-up" and spy for the other team. Fortunately for us, the additional accessories don't interfere with the figure itself if for some reason you don't want the Spytroops gear. The Spy Troops packaging is decent and still works well. The card is is a decent small size even though two figures are packed together. The insert shows off some attractive illustrations of the characters and serves as a file card, as well as housing a Joe comic written by the legendary Larry Hama. The figures themselves are nicely visible through the bubble so collectors can find their toy in perfect shape if necessary. It's a shame when a new version of GUNG HO, a classic figure, looks less interesting than the one before. 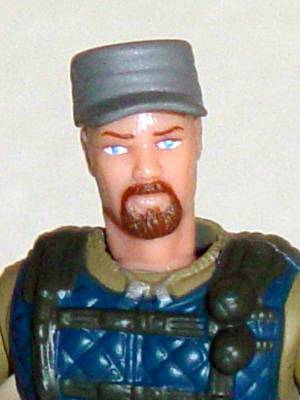 Yes, this version does sport a bald head (for use with a removable hat) but this figure just looks scared to death. To add insult to injury, he has a very generic costume that does not reflect the character it is meant to be on. This is unfortunately the trend lately on our favorite heroes. I may be a little harsh because it really isn't THAT bad, but it could have been a lot better. ZARANA overall has a decent head sculpt but the HUGE shoulders is something too hard to ignore. Thankfully, the gear provided for the sister of Zartan is an interesting set with a fair amount of detail in the clothing. The hair is pretty interesting and has enough attention put in. In the end, it's a so-so figure that I was really looking forward to. The paint application on both figures are all pretty decent. ZARANA stands out of the two for having a better color key than GUNG HO. With that said, the paint applied on both faces are done fairly well and I have no complaints with the execution. Average paint on so-so sculpts is just harder to judge. 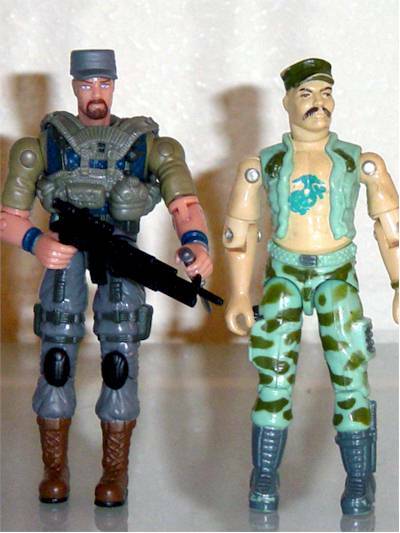 Both figures in this set have the standard issue 14-point articulation which consists of: ball-neck, ball-jointed shoulders, cut biceps, elbows, waist, legs, and knees. 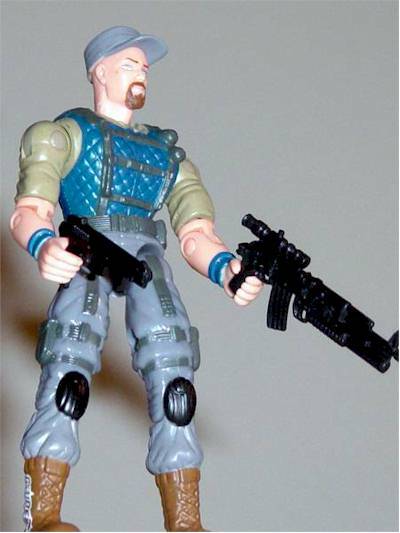 I took an entire star off because we have seen that the Joe figures are capable of additional points in the wrists, heel, and feet areas, which would make these figures a 20point wonder. Unfortunately that isn't the case here, but it's still good. 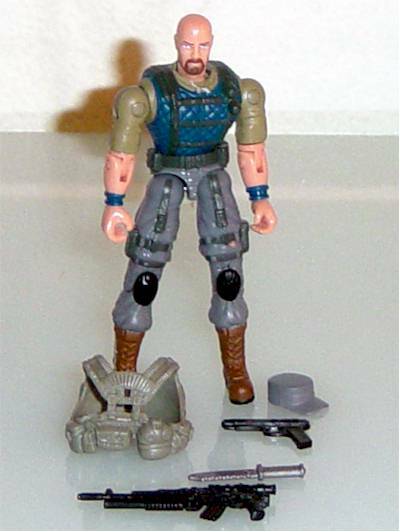 Joes always come with a fair amount of accessories, which is always welcome. GUNG HO is equiped with some gear that can be placed over the figure, two guns, a knife, and a removable hat! That's pretty darn cool! ZARANA'S gear isn't as impressive but it's ok. Some older collectors may recognize her rifle with a wind wheel attached to it. She also comes with another gun and the unattractive camo-poncho. Master of disguise, she is not. Two figures for $7.77 isn't a bad deal, especially if they have the amount of articulation that these figures do. But with the amount of articulation that we have seen possible on a few other Joe figures, I would pay $1-2 more if that were to become standard. As disappointed I was with the pair, they still make a fine addition to the JOE and Cobra team. GUNG HO could have been a lot better in regards to sculpting but it's acceptable. I will never stop complaining about the female figures and their giant shoulders, but ZARANA is still a good figure.